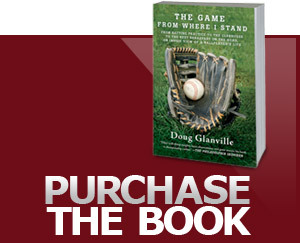 Doug Glanville's life experiences have helped countless Americans open up about race relations and shared humanity, but perhaps less known are his frequent and significant intersections with the Connecticut legal community. Doug Glanville’s life experiences have helped countless Americans open up about race relations and shared humanity, but perhaps less known are his frequent and significant intersections with the Connecticut legal community. In a conversation Thursday, the Philadelphia Phillies veteran, author and baseball commentator reflected on some of the knowledge he’s gained and wisdom he’s shared, which he’ll convey in a public talk Nov. 14 at the University of St. Joseph in West Hartford. Early 2014 was barely the beginning of the national consciousness of incidents between police and black Americans. Glanville recalled that his experience with police, lawmakers and community members has been markedly positive. One outcome, for instance, was the enactment of a Connecticut state law that prohibits local police from crossing municipal borders to pursue suspected violations of town ordinances. Glanville, whose wife Tiffany is an attorney and vice chairwoman of the Hartford Board of Education, said he never set out to punish anyone through the legal system. Instead, he met with friends, neighbors and public officials to learn and see what he could do to make improvements in light of his own experience. And it wasn’t the only time Glanville has been profiled. At Los Angeles International Airport he was refused a taxi specifically because he is black, he says. Changes in the airport’s cab policies followed. And even in Johannesburg, South Africa, Glanville recalled he was detained in a bizarre incident in which some people who appeared to be French tourists at O.R. Tambo International Airport were pick-pocketing travelers and attempted to lay the blame on him. But in addition to his successes on and off the field, Glanville has been fortunate to have some friends in law and government who have stood by him. With some guidance and dialogue, he was able to develop a strategy that focused on his natural ability to be open and friendly. He met with UConn School of Law dean Timothy Fisher and other professors at the school, along with his friend and neighbor, State Rep. Matt Ritter, an attorney who “was incredible,” Glanville said. “He took a lot of time, made introductions and helped me understand the implications of engaging in and understanding a bill,” Glanville said. Ritter, who took a moment away from his work as Connecticut’s current House Majority leader and the state’s controversial budget debate, discussed his friendship and work with Glanville Thursday. Another person who has become one of Glanville’s friends is former West Hartford Deputy Mayor Tim Brennan, also an attorney, who said he saw Glanville’s article in The Atlantic and “said holy cow, I want to hear this,” inviting the Glanvilles to speak to him about what happened. Brennan said any discussion of such issues “takes two,” and that Glanville was ready to talk to anyone and everyone. After the success of Doug Glanville Bill, last October Gov. Dannel Malloy appointed Glanville to the Connecticut Police Officer Standards and Training Council (POST), to continue discussing police and community-related issues. Majority Leader Ritter said he hasn’t heard of problems related to a police officer crossing town lines since the bill was enacted in 2015.